In Nairobi, the Strathmore Energy Research Centre (SERC) produces and sells solar-powered tricycles. The objective is to do business and above all to fight against air pollution affecting Kenya's capital. From Abidjan to Dar es Salaam, passing through Lagos and Douala, motorcycles and tricycles have become the main means of transport. The growth in numbers of the two or three wheelers is caused by the increase in traffic jams in cities and especially by unemployment, which is pushing many young people to become motorcycle taxi drivers. The massive presence of the two and three wheels in cities has consequences on the environment, particularly air pollution. In Nairobi, pollution from the motorcycle fleet is in addition to a situation already comparable to some Asian cities. “A motorcycle can produce up to 300 times more hydrocarbon emissions and 10 to 50 times more particles than an average gasoline car,” explains W. David Rubia, head of the Air Quality and Mobility Programme at the United Nations Environment Programme (UN Environment). It is in this context that a Nairobi-based company decided to tackle this pollution problem by manufacturing solar-powered tricycles. The tricycle, offered by Strathmore Energy Research Centre (SERC), is equipped with an electric battery, which is permanently charged by a solar panel that also serves as a roof for these three wheels. “The battery, when properly charged, can travel 50 kilometres,” explains Ignatius Maranga, an engineer and renewable energy researcher at SERC. If the sun level is not favourable, the driver can go home and charge the battery from a convenient socket. SERC is also working to make its solar tricycles more accessible. To reduce unit costs, the company must be able to produce in large quantities in order to achieve productivity gains. It plans to increase its production tenfold in 2019. This large-scale deployment will be financed thanks to the Valeo Innovation Challenge, obtained in October 2018 in Paris. It is a global innovation competition that has enabled SERC to win nearly 12 million Kenyan shillings, or 100,000 euros. A three-wheeled vehicle costs more than 100,000 shillings ($1,000). To make it easier for motorcycle riders, the young company offers a pay-per-use system, i.e. $2 a day over a three-year period. 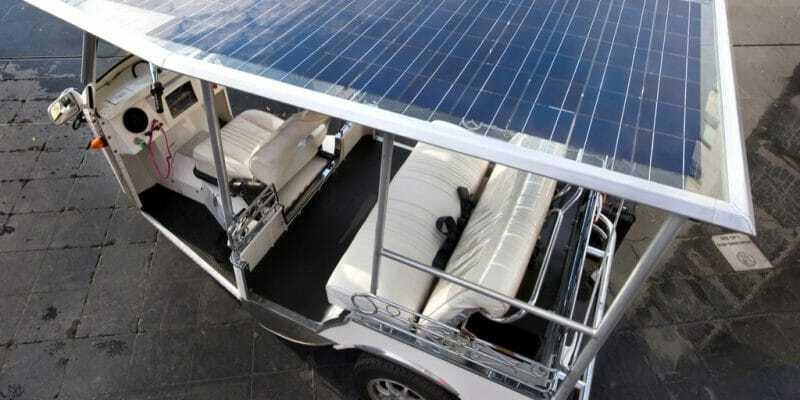 The company also plans to recycle the solar panels and batteries used on tricycles. “We are considering buy-back solutions for batteries, where tricycle owners will not fully own the batteries themselves, but will be able to return them and obtain a new one once their life span has expired,” explains Anne Wacera, quality manager at SERC’s research centre.